He is a graduate of Life University, school of Chiropractic . He is proficient in identifying health disorders in the musculo-skeletal system. His extended course of study is in the treatment and prevention of disc related injuries. 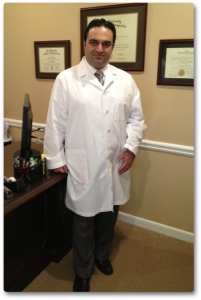 Dr. Mahallati has taken numerous post-graduate courses in nutrition, orthopedics, radiology, and rehabilitation. The rehabilitation courses have included extensive training in the diagnosis and treatment of whiplash injuries and conservative treatment of disc bulge and herniation. Dr. Mahallati incorporates traditional chiropractic corrections, Nimmo receptor tonus techniques. (This technique is a system of examination and treatment of tight, painful muscles which is very effective in relaxing muscles, relieving pain, restoring normal motion of the spine and joints of the body, and restoring normal nerve function). and low force techniques such as: Activator, upper cervical, sacral occipital technique, extremity adjusting, and Cox disc Decompression technique based on individual patient’s case uniqueness for spinal alignment and proper muscular tonus.